Partner Relationship Management (PRM) comprises an entire set of complex activities involving partner programs, policies, people and platform, with the ultimate goal of driving partner performance and satisfaction higher. However, in today’s global environment that is no small task. It is essential to have the right policies and programs in place; additionally, it is critical to have the right PRM platform to streamline both internal activities as well as how a company does business with its partners. If your organization is considering a way to transform your business digitally to reach a higher level of performance, then this is a must-read Guidebook. 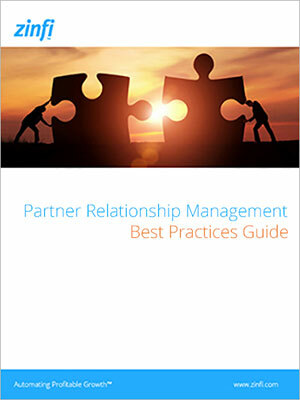 Download your COMPLIMENTARY COPY of the Partner Relationship Management best practices Guidebook and learn how you can build a high-performing channel. Unified Channel Management (UCM) Emphasizes the importance of comprehensive, long-term strategy to tackle the complexities of channel management in a global context; and explores key facets to developing a truly unified channel marketing approach. Partner Relationship Management (PRM) Explores various challenges including development of an integrated PRM framework, specific capabilities that best-of-breed PRM software should offer, how to select a PRM vendor and the importance of incentives management capabilities. Next Generation Partner Portal Unveils various aspects of setting up a partner portal and lead management system, including what works and what doesn’t . Also covered – future trends of partner portal design and development, as well as how to drive partner usage locally and globally. Want to expand your channel? Use ZINFI PRM. Modular: ZINFI’s Partner Relationship Management (PRM) comes with a comprehensive set of twelve individual modules, but you can pick and choose what you need. This allows you to start automating your channel activities based on the defined processes you have today, but as you define more channel programs, policies and processes, ZINFI’s PRM platform grows with you at no additional cost. Adaptive: ZINFI’s Partner Relationship Management (PRM) platform can be quickly configured to fit into your existing infrastructure, connect to other available sub-systems, but also give you the flexibility change or modify them based on your regional and global needs. This unique ability to have different work flows in different regions allow you to tailor your channel management approaches around the world based on local needs. Intelligent: ZINFI’s Partner Relationship Management (PRM) platform gives you an integrated 360 degree view of your channel program, policies and processes to drive your partner performance. The more modules you turn on, the better business intelligence you can gather and correlate programs and policies to high performing partners and partner tiers. This intelligent approach to channel management enables you to build a high performing channel.